Root veggie vindaloo soup from Eat Like a Yogi is liquid JOY. Root veggie vindaloo. Fun to say, delicious to eat! Once upon a time when I lived in Maui, there was this odd little drive-up window in a middle of a parking lot in Lahaina called Curry in a Hurry. It was my favorite place to eat, but like nearly everything in Hawaii, kinda spendy. So when I felt like a splurge I would take my entree and rice and ration it. A little for lunch, a little for dinner, and if I was feeling very sparing, I’d still have a teensy bit leftover in the morning to eat with my eggs (traditional Indian flavors like vindaloo go amazingly well with eggs…but then what doesn’t?). The food was extraordinary, but it’s highly possible that the reason I loved going there was to see the sweet woman who owned it (and was there every single day, in that hot little hut, serving gorgeous Indian food she and her husband had made themselves…my heart). This woman—I so wish I could remember her name—was one of those people that just beam with joy. She was never not smiling fully, deeply, from the essence of her being. I suspect it is one reason the food tasted so good. I had never heard of vindaloo until my friend the curry lady offered it to me one day. She told me everything I could have wanted to know about vindaloo, which I have since forgotten, but I have never forgotten her sing song voice and the way she said it: VIN-da-looooo. It sounds a bit like a song when you say it with enthusiasm, which she always did. Recently, wandering around the bulk spices at the co-op, I came across vindaloo curry seasoning and thought of my friend the curry lady. Where could she be now? For one reason or another she closed Curry in a Hurry shortly after I moved off of the island—a local treasure lost. Anyway, when I saw the vindaloo curry I knew I had to buy some though I had no idea what I would do with it. As it turns out, I ended up making this soup, which is far more delicious that I could have imagined. I think it might be the joyful essence of the curry lady, shining through. Wherever she may be, I dedicate this recipe to her kindness and work ethic. May we all shine so brightly! Cover the cashews with warm water and set aside. Heat the oil over medium heat and add the onions. Sauté the onions for five minutes, then add the sunchokes and carrots. Stir well and cover. Cook the vegetables together for five more minutes, then add the garlic, ginger, curry seasoning, tomatoes, salt, and water or broth. Once it reaches boiling, turn the heat to low and simmer 30 minutes. Collect 1-2 cups of the soup broth and pour it over the cashews. Blend well, until the mixture is smooth and even. Add a portion of the veggies and broth to the cashew mixture and blend to your desired consistency. Pour the prepared soup into a serving bowl or storage container (depending on when you’re serving it). Blend the remaining vegetables and broth with the coconut milk to your desired consistency and add it to the first batch you already blended. Whisk together to incorporate the two batches completely. Personally, I like this soup best with a little texture, so I use the pulse function on my Vitamix and keep a close eye on it as I go. 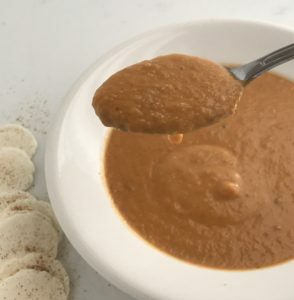 A puree is also nice, but this soup has a rustic quality that lends itself nicely to some chunkiness. Garnish with cilantro, chopped toasted cashews, plain non-dairy yogurt, or whatever else your heart desires. This recipe is delicious served over basmati rice.